See current and forecasted tuition and fees for Bryn Mawr, in addition to how these prices compare to the U.S. average. Learn how the tuition and fees at Bryn Mawr College match up to the average and learn how to effectively get prepared for potential price increases. How Does Bryn Mawr College Compare to Other Schools? The following table outlines how Bryn Mawr measures up to other schools nationally, regionally and by state. How Much Will Tuition & Fees Be for Bryn Mawr? Full-time undergraduates at Bryn Mawr College paid $50,500 in tuition and fees for the 2017 - 2018 school year, prior to adjustments for financial aid. $49,310 was the cost of tuition. $1,190 was fees. In contrast to public colleges, Bryn Mawr does not offer discounted tuition to students who live in state. Tuition and fees cover the costs of attendance for one academic year, but don't include room and board, which will be an extra charge you will incur when living on campus. Having said that, most students will end up having to pay less than full tuition after receiving financial aid and other rate reductions. Look at the table below to see 2017 - 2018 academic year costs. Visit the Part Time Tuition & Fees page to find out more. There has been a growth of 3.5% in Bryn Mawr College tuition and fees for out-of-state students in the past 5 years. Tuition increased by 3.5% and fees increased by 3.7%. This year, students should anticipate paying $52,273 if the growth keeps up. Due to price increases, the full cost of a four-year degree from Bryn Mawr will be $220,359, and the full price of a two-year degree would be $106,380, which doesn't include other costs such as books, transportation, and room and board. 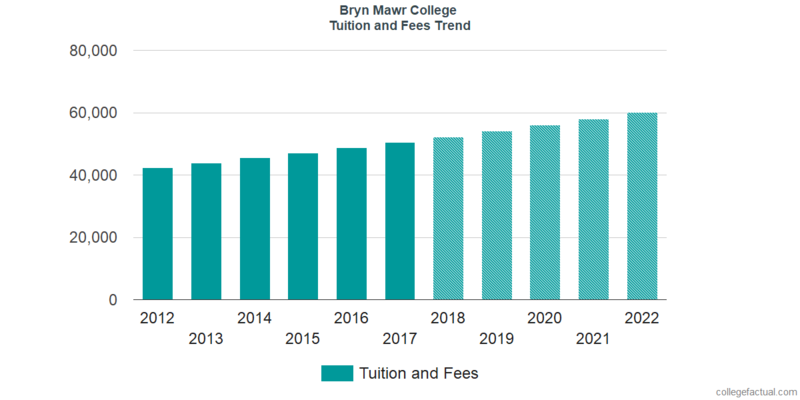 The following chart shows predicted future tuition and fees for undergraduate students at Bryn Mawr. Due to inflation and other variables, the price of college has a tendency to increase every year. For this reason your final year of college might be much more expensive than your first year.